I have played a metric ton of Aria Pro II basses over the years, and this has to be one of the easiest ones to play. 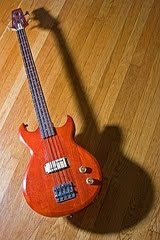 It is an Aria Pro II CSB-450 bass with the original red finish. The CSB in the model name stands for “Cardinal Series Bass”, whatever that means. It is made of alder, with a carved top and it has a set maple neck with a rosewood fretboard. These are considered a medium scale bass (820mm, or 32 inches). The serial number is 108175, which dates this to 1981. It is all-original and unmolested. The frets are in great shape. It retains the original electronics, with an MB-III pickup and volume and tone controls. It even has the original knobs. I set it up with new Ernie Ball Hybrid Slinkies (.045 to .105), and it sounds great. The passive electronics are very quiet. It is a wonderful bass, and, as I said earlier, it is really fun to play. Perhaps the best thing about these basses is that they are dirt cheap. You can find these on Craigslist or at pawn shops for under $200. This is a great value for a quality Japanese-made instrument. I had one of those basses a few years ago. It was a decent bass; the sound was stingrayish, in a crude sort of way. Paid $150 for it. P.S. Glad you didn't molest yours.